Make your own dairy-free alternative milk with my DIY vanilla chai cashew milk. This healthy, but rich and creamy beverage is fast and easy to make with no additives or fillers. I've been dairy-free for a while now. I never loved the taste of milk straight up, but I used to like cooking with it for its creaminess. I tried making my own almond milk and did the whole soaking, cheese clothing, and general messing up my whole kitchen. It's a lot of work, so I moved to buying dairy-free milk. Then I got tired of the fillers and additives in that milk, so I stopped drinking it altogether. Until now! Enter my easy, dairy-free, filler-free, paleo vanilla chai cashew milk. Yes, I cracked the code on making an easy and healthy dairy-free nut milk. Or I should say The NutraMilk did. The Nutra, what? The NutraMilk is this cool new culinary device that lets you make nut butter or nut milk in minutes, without any soaking, cheese clothing, or 10-step processing. Seriously. There's nothing else like it on the market today. Add your ingredients, set the timer, hit the "butter" button. Bam, you have nut butter! Wanting a tasty nut milk? Simply add water to your nut butter in step one and hit "mix." Done - dairy-free beverage! There's even a handy spigot and "dispense" button to pour your nut milk directly out of the machine so you don't have to flip it over, strain out any nut pulp, or dirty your counters. Click the picture below to see all of these easy steps in action and how I make my paleo vanilla chai cashew milk. You can also go beyond butter and milk with options for smoothies and creamy dips. It's a great device for allergy-sufferers or those simply looking to eat healthier. No need to worry about emulsifiers, sugar or stabilizers when you're making everything yourself. I was so excited to make quality cashew milk in my house again. Did I mention how much better homemade nut milk tastes? After taking The NutraMilk for a spin a few times, I started to get fancy, and I upped my dairy-free beverage game with a spiced up vanilla chai cashew milk. Dang, this is tasty. Paleo pals, this is also great when you have a little sweet craving since this recipe is packed with rich, creamy flavor. The chai spices make it feel exotic and decadent. So if you're interested in an easy and healthy way to bring homemade nut butter and milk in your home, I've got a deal for you. No, really, I have a special offer below. Just click on the box to take advantage of the deal. With the holidays coming up, this would make a great gift - for you or a loved one. And hopefully, that loved one lives with you, and likes to share. 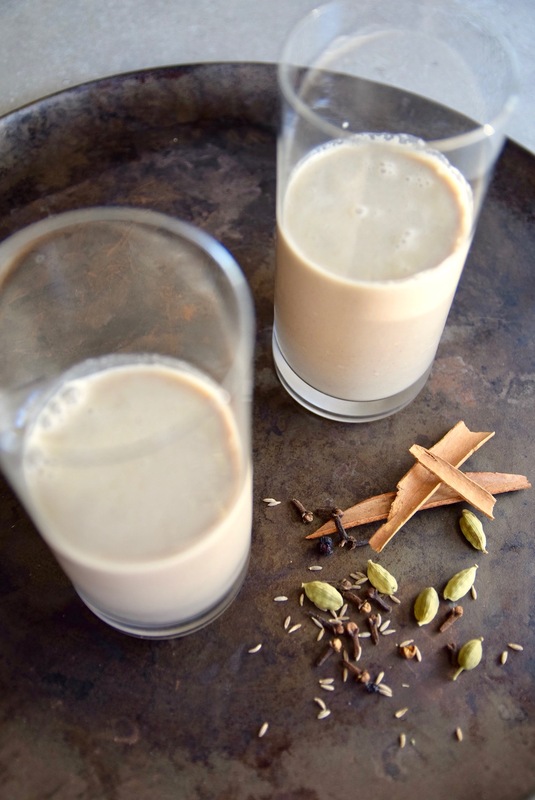 So enjoy The NutraMilk and your first recipe for my dairy-free vanilla chai cashew milk. Place all ingredients except for the water in The NutraMilk. Press the "butter" button and adjust the time to 3 minutes. After the time has elapsed, add the water and push "mix." When The NutraMilk is done mixing, place a glass container underneath the spout and press "dispense," and then "start." Open the spigot to pour the beverage into your container. The nut milk should keep in the refrigerator for up to 6 days. Enjoy! Looking for other beverage recipes? This post is part of a social shopper marketing insight campaign with Pollinate Media Group® and NutraMilk, but all my opinions are always my own. #pmedia #TheNutraMilk http://my-disclosur.es/OBsstV”.